Flip forward to this weekend. The problem with basing a growing decision on the memory of one distant but pleasurable meal at what may be the best restaurant on the West Coast is that though, if I wanted to, I could make a stinging nettle pizza, it would be nowhere near as good as the one in my mind. Over the years, I have idealized that meal fiercely, and even if I hadn’t, it’s still Chez Panisse, and I am certainly no Alice Waters. So when Sarah told me that my nettles were ready, I decided, adamantly, that I needed to find something else to do with them. I found this fabulous page about making stinging nettle pasta by Hank Shaw. But I am a pasta novice, and I didn’t want to waste the entire plant on a project that might not turn out. I found a bunch of off-putting health-food sites about nettle tea, and the burning question of whether it is the next “superfood” (whatever that means). 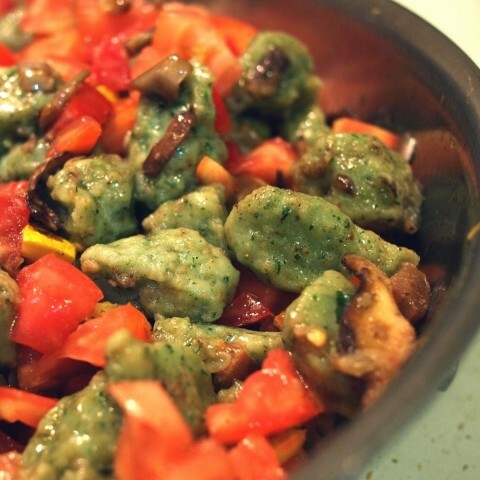 And then I found mention of something that I could do, and that I wanted to do: nettle gnocchi. 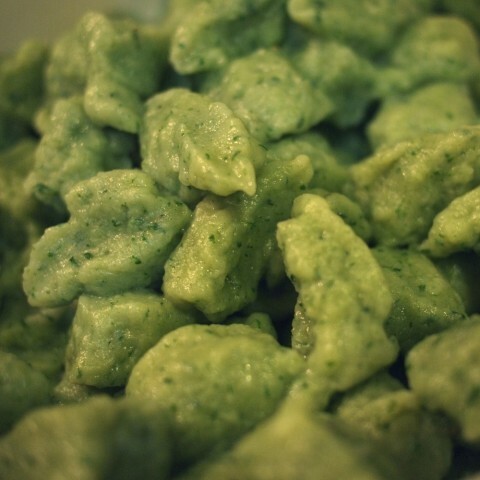 Gnocchi is easy, it’s delicious, it showcases flavors well, and dead simple as it is, it looks nice and impressive. So I did some calculating, some recipe-ing, and before long, the decision was made: stinging nettle gnocchi with sauteed vegetables in brown butter. Start by preparing the nettles: they are called “stinging” for a reason, folks. They have little hairs on their leaves that, when you touch them (or eat them raw), inject you with a dose of formic acid which, according to Hank Shaw, is the same stuff that fire ants use to make you suffer. Which means that you should always wear gloves when handing the plant or its uncooked leaves. And raw parts should never come anywhere near your mouth. The way to get rid of this nastiness is to blanch them. Get a gallon of water to a rolling boil, add salt until the water tastes briny, give your nettles a two-minute bath, and then swiftly fish them out, and into a bath of ice-water to cool them down and stop them cooking. As soon as they are cool, pull them out of the water and thoroughly wring the moisture out of them (no gloves necessary, anymore). They’ll look ugly — like a vivid green mass of mushy spinach. But they don’t need to be pretty where they’re going. Once you’ve done that: add the wrung-out nettles, the potatoes, and the egg to a blender or food processor and whirl until the potatoes are smooth and the ingredients have come together. Move to a mixing bowl, and a half cup at a time, add the flour, mixing thoroughly. You’ll want to stop when your mixture starts to look like a sticky dough. Add too little, and you have mashed potatoes. Add too much, and your gnocchi will be rubbery. It seems to me that the best way to judge is by taste. When it starts to taste just a bit more like raw bread than potatoes, it’s done. Once you’re dough is mixed, let it rest for an hour or two, and then either roll it out into long logs, and cut it into half-inch segments (the traditional way), or (as I did), scoop the mixture into a gallon ziplock bag with one tip cut off for easy piping. Either way, bring a new batch of salty water to a rolling boil, add your gnocchi in small batches (one or two dozen at a time), and cook until done. You’ll know they’re done because they’ll float. Once floating, give them about 90 seconds, then remove them to a holding area. Sarah said that she had a hard time tasting the nettle in the gnocchi, especially against the strength of the brown butter sauce. But I was able to taste it very clearly: a little bit like spinach, but nuttier, a bit more umami, with a faint oceaniness. I love nettles. Make all sorts of stuff with them. But I seriously can’t believe you planted them on purpose. They grow everywhere! I know. But my foraging skills are not what they should be. One day, I’m going to need somebody to show me around through the edible possibilities of Fairmount Park. Sounds really good. I’m glad it has oceanyness. Thanks for the great description.